Room rates are nightly, subject to 13% tax. Meals and beverages are subject to 20% service charge and 7% tax. Rates and state and local taxes are subject to change without notice. If you plan to arrive early in the day and would like immediate access to your room, we recommend booking the room for the prior night to guarantee immediate access. Similarly, for late departures, reserving an additional night will guarantee access to your guest room or suite until you depart. Should your room not be available upon arrival, we will be glad to store your luggage so you may enjoy all resort amenities. Upon check-in, guests must provide a valid credit card and government issued photo ID. The name on the credit card and ID must match the name on the room reservation. Complimentary rollaway beds are available for Premium and Atlantic Guest Rooms, as well as most of our suites. To ensure availability based on your reservation, we encourage you to make a request prior to arriving at the resort. 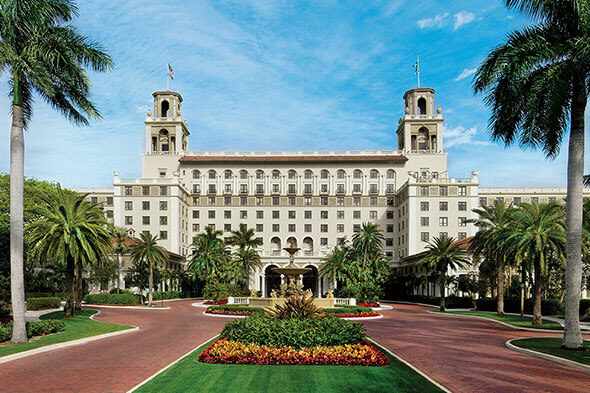 Please note that rollaway beds are not permitted in Deluxe guest rooms and suites, nor in the Flagler Club. Complimentary cribs are available for guests staying in our Premium and Atlantic Guest Rooms and Suites. To ensure availability, we encourage you to request your crib(s) prior to arrival at The Breakers. We apologize for any inconvenience, but pets are not permitted at our resort. For recommendations on local pet care and lodging, please contact a member of our Guest Relations team at [NAVIS: (877) 724-3191]. The Breakers is a non-smoking facility. Smoking is permitted outside of the building in designated areas. A one-night room deposit excluding tax is required at time of reservation. For stay dates between or overlapping December 24, 2019 through January 1, 2020, a one-night deposit excluding tax is required at time of reservation and full prepayment is due by November 1, 2019. Cancellation policies vary based on the time of year. Failure to arrive on your scheduled date will result in a cancellation of the reservation and deposit forfeiture. If a reservation is reduced in length of stay within the cancellation period, a penalty fee may apply. The hotel reserves the right to enter guests' rooms at any time to maintain the safety and security of our guests, staff and property.